Varian's TrueBeam is the latest automated radiation system that can kill tumors with sniper-like precision. Credit: Varian Medical Systems. (PhysOrg.com) -- Traditional radiation therapy has been used for years to kill cancer cells. The disadvantage of using this method is that healthy cells are also destroyed along with the cancer cells. In the past ten years radiation blasting robotic systems have been introduced that can target and fire with millimeter precision. These new super-accurate radiation-blasting robotic systems have been used in a wide range of cancer treatment and have proven their effectiveness in killing cancer cells while leaving the healthy cells untouched. 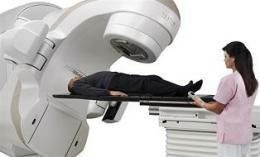 Accuray and TomoTherapy have been the two big names for years in providing state-of-the-art cancer treatment. Now a med-tech giant Varian has just released their automated radiation-blasting system called TrueBeam. This system provides more accurate targeting of cancer cells than the other two.